DID YOU KNOW that the second half of the nineteenth century saw more printed matter produced than ever before? The last two decades of the nineteenth century was the last era during which printed matter was almost the exclusive form of mass communication. Technical advances in printing and image reproduction happened rapidly throughout the second half of the nineteenth century, thus enabling a boom in the publication of magazines and journals. The boom spawned an incredible flowering in graphic design and the illustrator’s art. 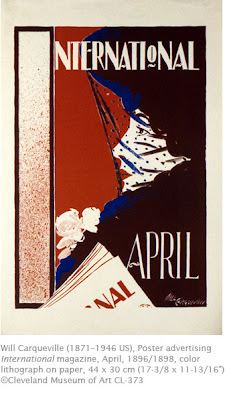 I’m celebrating the arrival of April (and hopefully warmer weather soon) with one of my favorite art genres: American illustration. Will Carqueville was born in Chicago. He was determined to become an artist. Studying briefly in Paris, he became acquainted with The French Art Nouveau style, and later the Aesthetics movement in England, which emphasized art-for-art’s sake, the introduction of art into every aspect of daily life. Seeing the immense range of poster illustration in turn-of-the-century Paris, he realized that as an artist he could make a fair living as an illustrator, while also pursuing painting. When he returned to Chicago, Carqueville established his own lithographic press. Of the many artists active in illustration in America during the 1890s, only a few show the influence of Art Nouveau in their work. Carqueville’s posters, like those of his English contemporaries, are less florid and decorative than French illustration. His work is characterized by simple, graceful compositions with elegant outlines and simple, flat areas of color. While maintaining a decorative surface, his work is typical of the fresh realism of American art. The asymmetrically-balanced compositions and large areas of color are the influence of Japanese art (“Japonisme”) that was current at the time. Carqueville established a good reputation within a short time. He produced magazine covers for International, Harper’s, Atlantic Monthly, Lippincot’s and Scribner’s magazines. He produced posters that advertised those publications, and also pursued painting, primarily realistic figurative work. Along with William Bradley and Edward Penfield, he is considered one of the finest of American illustrators during its flowering between the 1890s and 1920s. You can see more of Carqueville’s work among hundreds of other American illustrators at the website of the International Poster Gallery in Boston. There, you will really get an idea about the American style of poster and illustration art. Students can learn to create their own prints and graphic designs with two new books from Davis Publications: Experience Printmaking and Communicating through Graphic Design. Carqueville's artwork is perfectly designed for a magazine cover or poster with the large blocks of color and clean lines. A poster or cover needs to be both bold and easy to decipher so that viewers can immediately recognize the brand and message, something that Carqueville seemed to capture very well. Thanks for this bio - very inspiring! You're welcome! If you haven't already check out the work of the other two artists Bradley and Penfield. Together these three in my mind are the Triumvirate of American Graphic Design! Great blog. Thanks for the information. The information about the American Poster Design are really too good and informative. I agree, so many great designs came out of the late nineteenth century. The International magazine pic you've provided is a fine example.